At the end of July 1882, a strange package arrived at the Madrid Customs laboratory which was under the direction of Gabriel de la Puerta-Ródenas, a Spanish chemist who lived from 1839-1908. Destined for Spain’s Prime Minister, the Spanish authorities, fearing for the Prime Minister’s life, decided to have the package examined. They first turned to the Army laboratory, and then to the School of Mines’ laboratory in Madrid, but both refused to open it. Fortunately, De la Puerta, a renowned chemist, pharmacist, botanist and doctor, was willing to take on sensitive assignments, including dealing with packages that could contain chemical substances. He opened the package, deactivated the bomb and started analysing its content. This historical anecdote is just one example of the important role played by Customs laboratories, and their special consideration and significance for national governments. 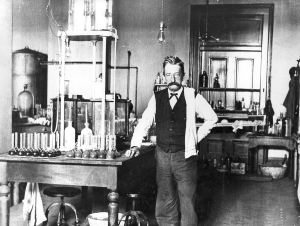 Science historians have extensively studied the contributions and work of many relevant scientists from different ages, and more recently, they have also considered scientific spaces such as hospitals, including academic and municipal laboratories, but Customs laboratories have scarcely been studied. It is true that the total number of chemists – and other experts – working in Customs laboratories is smaller than in other chemistry sites, and that such laboratories are less known by society than other laboratories open to students or the general public. Moreover, undertaking a study on Customs laboratories could be rather problematic as historians have to deal with dispersed original sources and archival material, and very often, these laboratories are located in different cities and within different government departments, such as Customs houses, port authorities or treasury offices. Governments have been employing science to prevent fraud and to improve their revenue collections over the centuries, but important changes in the pattern and volume of trade in the mid-19th century required a new approach in this domain. As new products and merchandise were being exchanged between countries, mainly due to the reduction in transportations costs, new spaces and experts were needed to enforce tariff regulations. Although they now only account for a small amount of the national revenue in many countries, during the 19th century, Customs duties were an important source of income for governments. For instance, they represented about 15% of the Spanish government’s revenue in the mid-19th century, and they were almost the exclusive source of income for the United States (US) government before the civil war. The Analytical Laboratory of the Straits Settlements in Penang, Malaysia was set up in 1909. Although the academic, scientific, economic and socio-political contexts differed from country to country, the creation of a Customs laboratory was a great step forward in improving the efficiency of Customs services everywhere. These laboratories were a new scientific platform to provide general technical support for law enforcement activities. In Spain, before the creation of a central Customs laboratory, a Customs chemical office had been in existence since 1850. Although also managed by the Ministry of Finance, it had only one chemist and a clerk in attendance with limited resources. One of the factors which triggered the creation of the laboratory was the sudden growth in the volume of alcohol, including cheap alcohol produced for industrial proposes and not for human consumption, imported into Spain after the adoption by other European countries of new taxes on alcohol in the 1880s. The government felt that it needed more and better chemical analyses to deal with these imports as well as with other products such as petrol, oil, asphalt, sugar and other goods not produced domestically. @U.S. Customs and Border Protection historical collections – Chief Chemist Walter L. Howell analyzing sugar at the New Orleans laboratory, 1906. Most countries having established a single Customs laboratory started expanding their numbers between the late 19th century and the first part of the 20th century. The US created one of the most decentralized Customs laboratory networks. Its first and biggest laboratory was located in New York, as the city port received about 70% of all US imports. New laboratories were also established in cities such as Chicago, Philadelphia and San Francisco. In the United Kingdom (UK), the network spread even faster, from one laboratory in London in 1842 to 28 ‘chemical stations’ in the 1870s. France also started creating a large network of Customs laboratories, starting with five laboratories in 1875, and expanding to 16 by 1897, although some were closed shortly thereafter. The expansion in Italy and Spain was slower. In Italy, a central Customs laboratory was created in Rome in 1886, with a regional branch in Genoa. Later – between the 1890s and the 1930s – nine new laboratories were established. Meanwhile, Spain maintained a very centralized system with just one laboratory located in Madrid, until the 1920s, when the director of the Madrid laboratory convinced the government of the need to develop a network of regional laboratories as the country, emerging from World War I, began enjoying strong growth and rising trade exchanges. Ten new laboratories were set up in cities such as Barcelona, Seville and Valencia during the 1920s and the 1930s. The decentralization of the laboratories implied the organization and expansion of the service. In Spain, 20 chemists and pharmacists passed a public examination to be appointed as Customs chemists in 1925. After a short practical training period, under the supervision of the director of the Customs central laboratory in Madrid, they were moved to the newly-created regional Customs laboratories. The new structure of the service included one director, four chemists and one clerk in Madrid, as well as a director and a chemist in each regional laboratory. Customs laboratories are exceptional spaces, where scientific, economic, regulatory and administrative knowledge is combined. In many countries, they have been headed by some of the most recognized and influential scientists of their time. Stanislao Cannizzaro (1826-1910), who built a modern and well-equipped chemical laboratory in Rome, Italy, was one of greatest Italian chemists and is considered as having contributed to laying the foundation of modern chemistry. Ulysse Gayon (1845-1929), one of the favourite pupils of the French scientist Louis Pasteur, was in charge of the Customs laboratory in Bordeaux, France. In the UK, British chemist Edward Thorpe (1845-1925), who served as President of the Society of Chemical Industry, took over the direction of the Somerset House Laboratory, also known as the Government Laboratory, which was originally established in 1842 for the prevention of the adulteration of tobacco products and then expanded by the 1875 Sale of Food and Drugs Law. Thorpe moved the laboratory in 1897 to a new building of his own design and helped to further the effectiveness and reputation of this government laboratory. With his staff, he worked on matters of public health, including the detection of arsenic in beer and the elimination of lead from pottery. In the case of Spain, there was Gabriel de la Puerta-Ródenas, mentioned in the opening paragraph of this article, and José Casares-Gil (1866-1961) who had notable academic and political authority. Both were chairs at the University of Madrid, fellows of different national and international scientific academies, and also members of the Senate. Because of their location between the scientific world and the economic world, Customs chemists were experts at circulating between different spaces – universities, academies, industries, administrative offices, and even courts – and frequently participated in controversies or disputes with economic and social implications. For instance, in the 1930s many chemists, agriculture engineers, diplomats and grape producers from different countries participated in international conferences to agree on a “wine quality” standard that included common gauge practices and chemical operations to test this alcoholic beverage which was highly taxed at that time. When importers or traders were not satisfied with the results of the chemical analysis, usually because they had to pay more taxes than expected, they were allowed to request a second analysis of the merchandise. Afterwards, it was even possible to appeal the chemical test to a Customs court, where chemists had to explain their scientific procedures and the report. In other cases, there were problems related to the use of different standards to determine quality or purity of substances, so the value of the merchandise was different depending on the country. Finally, there were also economic disputes among different countries that imposed Customs taxes to protect their domestic goods and their national economy. Although these issues are still current and valid today, the establishment, after World War II, of new international regulatory organizations, such as the WCO, was a crucial step forward in reducing economic disputes, achieving standardization and improving the administration of Customs, thereby facilitating international commerce. References pertaining to this article may be obtained directly from the author, Ignacio Suay-Matallana.